Knitting for babies is always a wonderful thing! They could always use items knit and crocheted with love. I also feel that it’s a great way to test the waters with garment knitting without taking on a huge project that requires over a 1000 yards of yarn and hours of construction, and seaming. Helena by Alison Green is a free pattern from knitty.com. The sizes range from 3 months to 4 years and requires 405-675 yards of DK weight yarn. This sweater is knit from top down with raglan construction. It has a lovely but easy lace pattern on the “skirt” of the sweater. 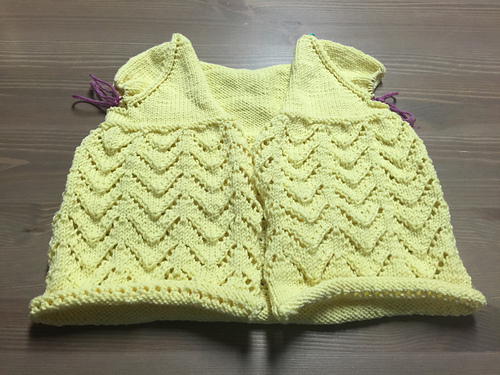 For advanced beginners to intermediate knitters, this pattern is quick knit that can be replicated for children of different ages! 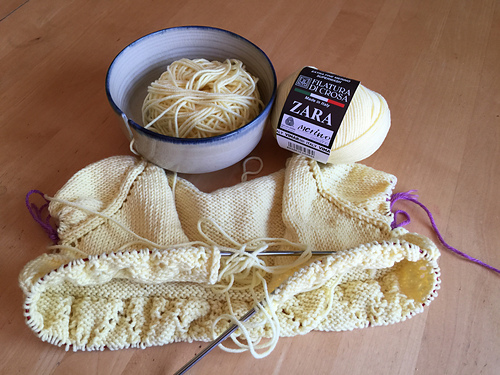 For the newer knitters, it gives a chance to practice the backwards loop cast on method, a.k.a “the single cast on”, which Lion Brand provides a great video tutorial on YouTube and written instructions are provided on the knitty’s website with pictures to go along. 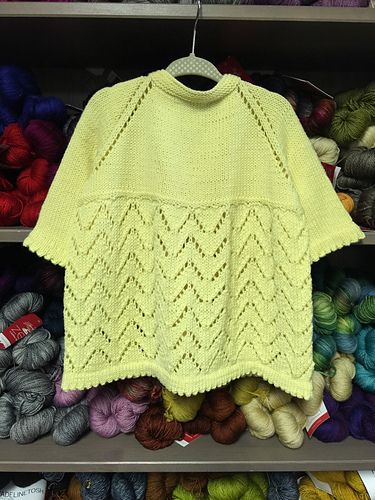 Rhonda knit Helena using Filatura Di Crosa Zara, a superwash merino DK weight yarn, in Light Yellow. Zara is a classic staple yarn, which comes in a vast variety of colors, and is perfect to use for this sweater and any baby item really, as it is machine washable, a plus when making something for babies, which can be adorably messy. Tie closures were used in the original pattern, which were modified in the finished sweater at The Yarn Attic. Rhonda instead used I-cords as ties in place of the garter stitch ties. Buttons can be used in place of the ties, if preferred. Tosh Merino DK a single plied, hand dyed yarn that has more depth and tone and it’s so squishy soft! Ella Rae Cozy Soft Yarn a machine washable acrylic wool blend that stands up to the challenge of being baby friendly yet still incredibly soft and comfortable against the skin. It is available in solids and prints, a tonal version of Cozy soft. Ultra Pima Paints by Cascade Yarns is also a great option that comes in variegated colors. It is 100% hand painted, easy to care for, Pima Cotton. Machine washable and can be tumble dried! 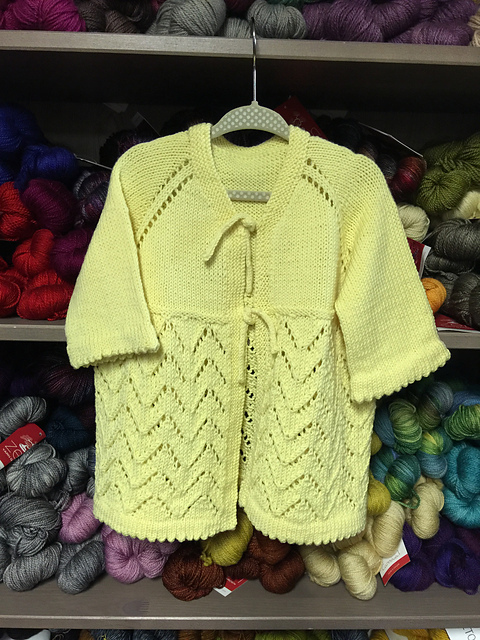 Sirdar Snuggly Baby Bamboo is a great choice to make this sweater a bit lighter since it is 80% Bamboo Viscose, 20% Wool. It is also machine washable! Follow us on Instagram @theyarnattic. Hashtag your finished projects and WIPs #theyarnattic #WIPwednesday #FinishedObjectFriday! We love to see what you’re up to!